by Source For Sports Tips for Parents Oct 4, 2018 So you've purchased all your kid's hockey equipment. We'll explain how to stuff it all in their bag. If you and your child are new-to-hockey, you will be learning all the details of how to dress your child in their gear, lace their skates, and tape their stick. Once the game is done, you will also need to remove the equipment and pack it into the abyss of their hockey bag. Have your child sit on the bench and remove the hockey skates. Open the laces fully and pull the tongue open to help the inside of the skate to dry. 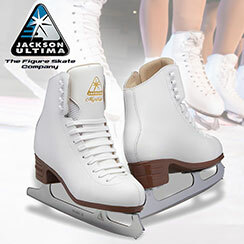 Always wipe the blade with a clean skate towel to remove any moisture which can cause rust and corrosion. Put blade covers on, and place the skates in the bottom of the bag at one end. Unbuckle the helmet and cage straps, and gently pull off the head as your child releases the mouth guard, and place the helmet on the bench beside the bag for the moment. The mouth guard can be detached and put into the case, ideally after rinsing it first. The elbow pads can be removed, nestled inside one another, and placed in the end of the bag beside the skates. Remove the shoulder pads, and lay flat on the bottom of the bag. You can now place the helmet in the bag on top of the shoulder pads, pushed towards one side. The gloves can be put in the bottom of the bag at the opposite end from the skates and elbow pads. The neck guard can be placed inside the helmet – this way these two pieces are together when you are dressing your child and the small neck guard won’t become elusive among the rest of the equipment. The hockey pants can be placed on top of the shoulder pads and the shin guards can be placed within the leg of the pants, which will save a lot of space. Put the hockey socks together, fold and tuck into the other leg of the hockey pant. Show team pride by respectfully folding the team jersey with the crest showing, and place on top of the equipment before zipping the bag closed. 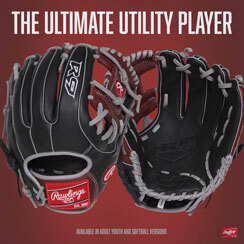 Once you get the gear home, you can open the bag to allow the air to circulate to help dry the equipment. You can also use an equipment tree to dry the gear, or use a rocket dryer for quicker results. Source For Sports can help you make the transition from new hockey parent to veteran hockey parent. Check out our learn tab for more How To tips. 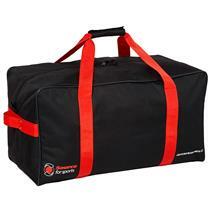 Winnwell Source For Sports Basic Junior Hockey Carry Bag available for sale at your local Source For Sports store. 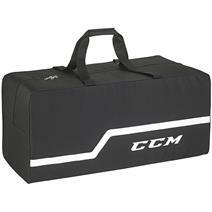 CCM 190 24" Hockey Carry Bag available for sale at your local Source For Sports store. 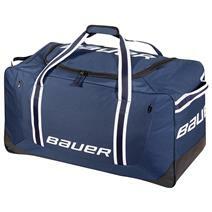 Bauer 650 Small Wheeled Hockey Bag - Navy available for sale at your local Source For Sports store. CCM has redesigned the Ribcor 70K hockey skates to provide an even lighter, more comfortable option on the ice. Accuracy. Control. Feel. That’s what TRUE promises with their new XSeries line of ACF hockey sticks. Our hockey professionals test the product so they have hands-on experience for when you need advice. 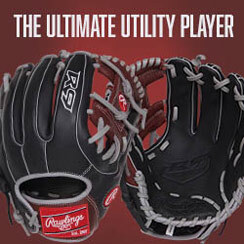 At Source For Sports, our hockey professionals know the gear inside and out. Our Pro-Formance Advantage Custom Fitting System ensures that you receive the proper fit and understanding of why the product works for you, no matter what level you play. Source For Sports has worked in collaboration with Bauer to design five Source Exclusive Bauer skate models that include numerous upgrades for a higher quality skate at a lower price. Start with the CCM Ribcor 68K hockey skates, add some stellar upgrades taken from the outstanding Ribcor 70Ks, and you’ve got the Source Exclusive CCM Ribcor Platinum hockey skates. 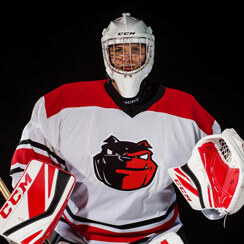 Maximize your comfort and protection with proper fitting hockey pants and equipment. Learn the basics when it comes to fitting hockey pants.